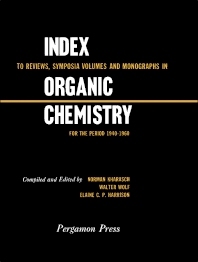 Index to Reviews, Symposia Volumes and Monographs in Organic Chemistry for the Period 1940-1960 presents a resume of published monographs, reviews, and symposia lectures in organic chemistry. The editors adopted the plan of listings by symposia volume or journal, backed up by the total subject and author indexes. In this way the user can readily locate a particular article through the author index or the subject index; or should he recall that an article appeared in a particular source, the chronological listing in that source can be scanned quickly. The Index gives a convenient overview of the accomplishments of organic chemists during this very prolific period of the growth of the field. Frequently, several articles on the same or similar subject appear, hence the historical perspective can be sensed by rapid evaluation of the reviews selected. This Index will be useful to research workers, teachers and students. It will also assist editors and authors to select specific areas which require critical review.